On 1 July 2015, a shared desire to improve the management of Côte d’Ivoire’s wetlands brought together experts from the Ramsar Convention Secretariat, Ministry of Water and Forests, NGOs and the academic community at a seminar held in Abidjan. According to the Director General of Water and Forests, Colonel Soro Yamani, the application of the Strategic Plan of the Ramsar Convention, which Côte d’Ivoire ratified in 1994, has been very weak. “At present, we do not know the status of our sites. Some have no clearly identified managers”, he reported. The six sites listed on the aforementioned convention are Grand-Bassam region, the Fresco wetland, the Azagny National Park wetland zone, the Ehotilé-Essouman Islands region, the Sassandra-Dagbego Complex wetland and the N’ganda N’ganda region. The Ministry of Water and Forests considers it essential to ensure that the pressure placed on these sites does not harm the wetlands’ ecosystems. “These zones make a significant contribution to the economy in terms of water supply, fishing and agriculture”, explained Colonel Soro. 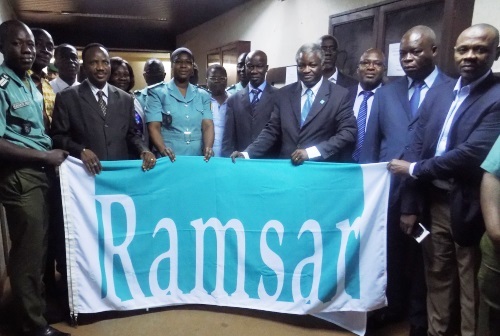 Around twenty managers of Ramsar sites received training aimed at addressing this issue. The objective? To improve the sustainable development of wetlands both through their development and promotion and by defining management approaches. The training was facilitated by the Ramsar Senior Advisor for Africa, Paul Ouédraogo. “These experts need to prepare a roadmap in order to carry out the Ramsar’s mission. The importance of this work is tremendous; conserving wetlands and using them sustainably will bring prosperity” stated Paul Ouédraogo. An outcome of the training was a well elaborated roadmap including a time frame and key activities, financial partners and mechanisms to pilot the implementation of the Ramsar Convention’s objectives in the country. It is important to note that Côte d’Ivoire has significant water resources, with over 3,477 km2 of watercourses and water bodies, 572 reservoirs, 11 major watersheds and around 130 water bird species.